I’m excited to share that Israeli Minister of Defense, Moshe ‘Bogie’ Ya’alon joined us in saluting thousands of our cadets at an impressive event hosted by Israel Sci-Tech schools and the IDF in Jerusalem. In three years, our number of cadets increased from 2,000 to 4,000 in almost 40 schools across Israel. These keen youngsters are part of our groundbreaking cadet corps at almost 40 of our schools and colleges, and enjoyed the opportunity to demonstrate their fascinating innovations to family and guests. 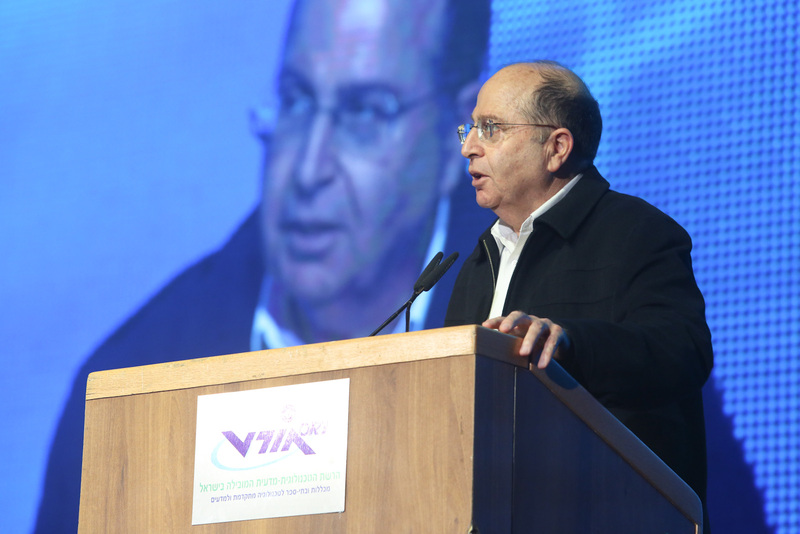 Defense Minister Ya’alon congratulated Israel Sci-Tech on 65 years of educating hundreds of thousands of students and training them to them to be the best in the sciences and technology vital to Israel. 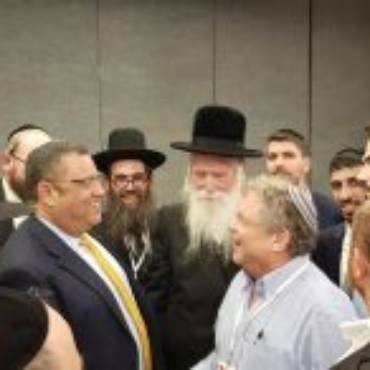 He emphasized that the IDF and the State of Israel have enjoyed the fruits of Israel Sci-Tech, with generations of young people who serve in all arms of service of the IDF. Our tiny country relies on brains more than brawn. We’re making it happen. Students set out on the cadet track at the age of 15, three years younger than the required age for military service. They join IDF ranks, complete their matriculation then get a practical engineering certificate. Crowds watched as this cadet innovation, a red robot, threw a large blue ball 2 meters in the air. It is more than fun – this has serious applications in the IDF. This Corps contributes to the IDF’s rapid technological growth, preparing the IDF to confront enemies who seek to harm Israel. The IDF’s Lotem-C4i Technological Division, for example, develops technologies to thwart attacks and bolster Israel’s defenses against cyber warfare. 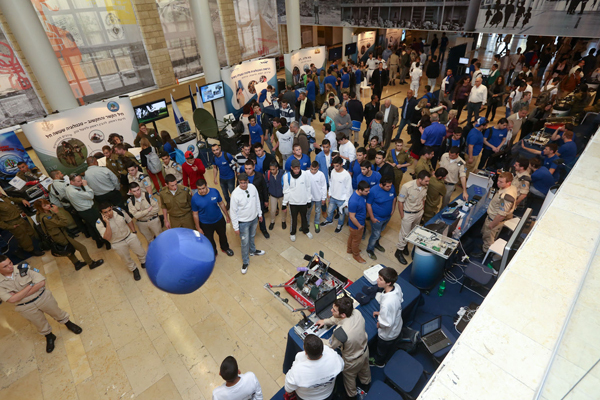 Guests explored cadets’ projects; the Red Alert system based on methods of image processing, an advance warning system that predicts the real time landing of a rocket; a system that detects signs of hacking and sends an alarm warning to your mobile phone and a system to design electricity for a synagogue. IDF commanders are dispersed throughout our schools to provide this side of their education. The cadet program has motivated students to do their national service in the IDF. This is critical, because the younger generation has come to take the State of Israel for granted and shy away from army service. Cadetship is truly education for the future: it is good for ensuring high quality manpower for the IDF and Israel – and good for the students who are taking firm steps towards independence. Cadets exist in many countries, including the USA. Israel Sci-Tech initiated our cadet program in response to an immediate need in the IDF, the country and amongst our students. You could say it is adapting an ‘old’ system in a new world. For the first time in Israel’s history, a Bedouin Air Force unit has been opened with our Bedouin schools in the Negev, thanks the unique relationship between Israel Sci-Tech and these remote tribes. It may be cool wearing an IDF uniform and serving at an IDF base but it goes further than the khaki. Some of these students struggled in the mainstream academic system or came from challenging environments with poor role models. Now, while their peers worldwide explore the vagaries of teenagehood, cadets thrive in an orderly lifestyle with positive role models, they learn leadership, comradeship, self-control, goals and purpose. They develop patriotism and pride in themselves. Their matriculation and qualification puts cadets streets ahead of their peers – during their IDF service they serve in specialized positions. They are also virtually guaranteed of a long-term career either in the IDF or in industry. Read about our students’ studies in Israel’s high-flying aviation and space industryin the ‘seearch’ box.